What are your priorities? That's the question you should ask when determining whether running or swimming is a superior workout. Both offer value in cardiovascular health, respiratory strength, disease prevention and calorie burn, but both aren't necessarily suited to everyone. Consider how each of these exercise modalities affect your primary goal in exercise, and that will help determine which one comes out on the top of your priority list. Swimming offers a notable calorie burn when it comes to most strokes. Swim 30 minutes of the butterfly or the crawl and burn 409 calories, if you weigh 155 pounds. The true numbers will vary based on your weight. The backstroke comes in at a lower caloric burn because it uses a bit less energy, with just 298 calories burned in 30 minutes. Comparatively, running at an average 6 mph for 30 minutes burns 372 calories. However, if you pick up your pace and go 7.5 mph, your body burns 465 calories. Slow down below 6 mph, and you'll burn fewer. Again, it's dependent on your weight. 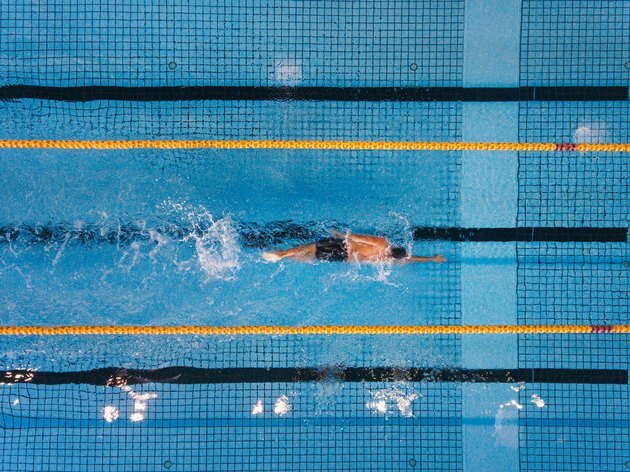 For the most part, swimming and running are about equal in terms of energy expenditure. But, for both modes, you have to be going at a strong, intense pace to really burn those calories. When you run, especially if you set the treadmill to a specific pace, you have no choice but to burn calories, but it's easy to lallygag in the pool and skimp your effort. Swimming also takes skill and conditioning to go at a serious effort. Inefficient form can make you feel like you're putting forth a lot of effort, but in reality, you're not burning as many calories as you think. Therefore, if you want to be guaranteed a good calorie burn and you're not an Olympic swimmer, running might be best for you. Not everyone has access to a pool or open body of water in which to swim. Add to that a supportive suit, goggles and swim cap, and you've got to pack to get your workout going. Even if you're lucky enough to have a pool in your backyard, it may not be a pool that's suitable for aerobic lap swimming. Running, however, is just a good pair of shoes and a sidewalk away. Most people can head out their front door and go a few miles without much thought. A run is also exercise you do on business trips or vacation, even if your hotel doesn't have a pool or a beach location. If you're new to exercise or out of shape, expect an adjustment period before getting good enough to really burn calories and see cardiovascular benefits from doing laps in the pool. Skill and technique matter in the water. You may find it difficult to spend much time swimming without getting winded and frustrated and thus fail to achieve the recommended 30 minutes of exercise, most days per week. Running, however, is relatively easy to learn. A beginner may easily progress from walking — which also offers cardiovascular benefits — to jogging, as long as she has healthy joints. 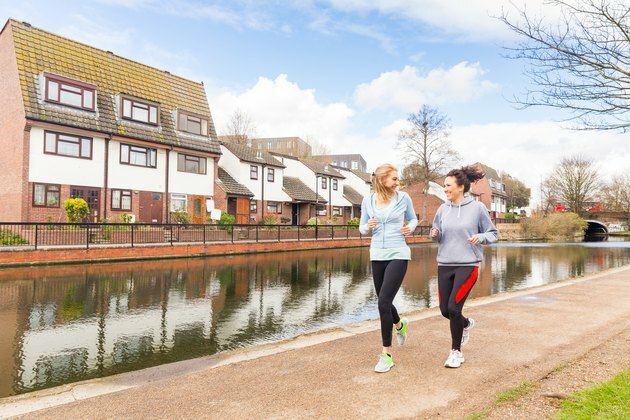 If you've got healthy joints and ease into running gradually so as to prevent shock to your system, both running and swimming can be excellent for most people. If you're prone to joint pain, have orthopedic issues or suffer from arthritis, though, running may just not be for you. The buoyancy of the water supports your joints so swimming becomes a far more comfortable and feasible option. 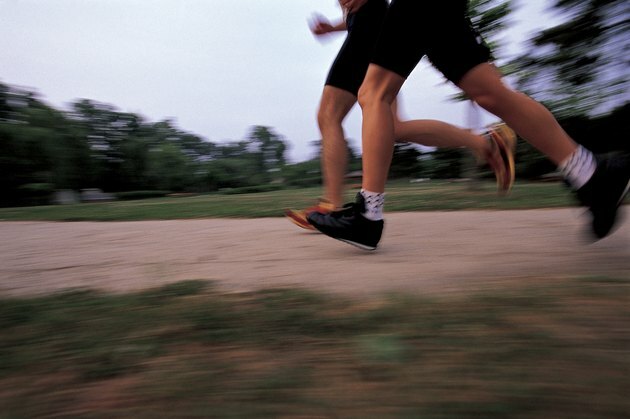 If you engage in exercise to build bone density, running should be your choice. The same buoyancy of the water that supports your joints prevents it from being a weight-bearing exercise. Weight-bearing exercise helps people, especially women and girls, build and maintain bone density to reduce the risk of osteoporosis later in life. During your teen years, bone density builds exponentially, so weight-bearing exercise at this time is ideal. However, it's really something you should maintain for a lifetime. Bone tissue breaks down and reforms all the time. It needs the stress of impact and pull of muscle to become stronger. Read More: How Does Exercise Increase Bone Density? The New York Times: Run Vs. Swim? How Does Swimming Keep You Fit? What Burns More Calories: Swimming or Walking?